The ADuCM3029 EZ-KIT (ADZS-UCM3029EZLITE), Analog Devices, Inc.is an evaluation system for the ADuCM3029 processor. The ADuCM3029 processor is based on the ARM® Cortex®-M3 processor core, a collection of digital peripherals, embedded SRAM and flash memory. It also contains an analog subsystem which provides clocking, reset and power management capability in addition to an ADC subsystem. The ADuCM3029 Microcontroller is designed specifically for Motor Control and Industrial applications. The EZ-KIT ships with all of the necessary components required to start the evaluation immediately. The EZ-KIT contains an array of three connectors that support the ADF7xxx Wireless Transceiver series of daughterboard products. The EZ-KIT contains an expansion interface 3 (EI3) and Arduino interface. These interfaces provide for connecting with daughter boards to expand on the functionality of the EZ-KIT. 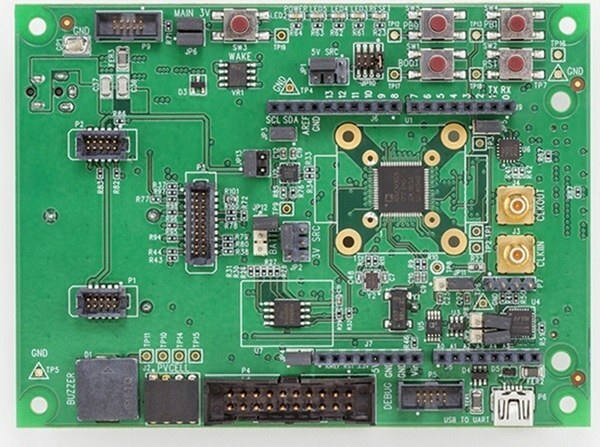 The evaluation board is designed to be used in conjunction with the IAR Embedded Workbench and Segger development environment for advanced application code development and debug.